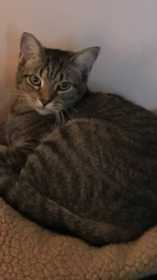 Nala is an indoor cat who got out of the house (Gaylord and Grand River cross streets, Redford, MI) on March 21/22. She is a short haired brown tabby - brown fur with stripes and tan fur on her underside. She is friendly, but very shy and afraid of humans that she doesn't know. We are desperate to find her!